Part 2 of Robyn Watts‘ enormous contribution features the three hit music stations that Chicago sported as the 90s began. This is ALL CHR, and only ONE of these stations is still around in the same form it was back in 1990. The way this was put together, we get a couple of minutes with each station, then a ‘divider’ element, and on to the next. It goes round and round with each station sampled several times during this more than 30 minute scope. Q101 features ‘Your Man Calahan”. WKQX is more AC sounding and most likely is a HotAC station in reality than CHR, but the tape came in labelled “CHR Wars” so we’ll go with it. Brant Miller is Z95’s featured jock on the front of this composite and he sounds SO much like anything did on the old WLS – AM OR FM! In fact, it seems as if much of the WLS-FM staff carried over to WYTZ, as Susan Platt is heard during a later segment after Brant Miller. Listen for a ton of Eddy and Jobo promos during the B96 segments. B96 seems to be a bit more rhythmic than the other two stations featured here. Our advice is to just listen for yourself and decide if Z95 (“Chicago’s Hit Music Station” the positioner during this time period) is hotter than B96, and if Q101 is leaning more CHR or AC. It will be a FUN listen, either way! This tape was produced by “Hecht Enterprises”, an aircheck service which was apparently active through the 1990s. Listen to other airchecks from Robyn Watts using this link. Thank you Robyn for sharing all the great airchecks! No problem, Doug. Sorry it took so long to reply. This composite was actually recorded from around February 1990 (February 13th was the date of Billy Joel’s “Storm Front” show at the Rosemont Horizon and the changover to the “708” area code were key highlights in determining the date). 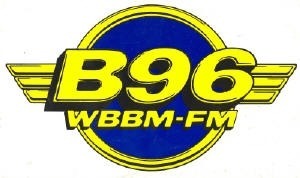 B96 was just shortly about to become “Killer B-B96” and focus more on Chicago’s Dance and House music scene. They would shortly hire Gary Spears from Q107/Washington for PM Drive and George McFly from WAVA (also from Washington) for Nights. This, along with some other changes, help B96 solidify its dominance. Z95 was suffering from what a number of Mainstream CHRs were going through at the time: Lack of product that appealed to teens that would also appeal to adults demos. Much of the hits were either one hit wonders, dance, rap, or bubblegum pop. “Rock 40” (i.e. Pirate Radio/LA) turned out to be a failure due to the perception that they played “hair-metal bands only”. which in Pirate’s defense was not true!) Many stations started to leave CHR altogether beginning in 1990 and it wasn’t until the “Pop Boom” of the mid-90s when that trend begin reversing itself. Z95 was struggling until it wound up with a 2-something share in early 1991. Consultant Randy Michaels (fresh from his ratings victory in Tampa with WFLZ) was brought in and “Power Pigged” Z95 (which soon became “Hell 94.7”, “Hot 94.7”, and finally News/Talk WLS-FM, knocking it out of the CHR format altogether). Audio of Z95’s first few days under Randy Michaels exist under the other WBBM-FM/WYTZ composite from 1991. I take it you were in Chicago during those days! What a memory! Thanks for filling us in, Robyn! I always wondered. Q101 takes the props here with the JAM Skywave package! The night time jock on Q101 is Carla. At 11:00 what song is starting as the weather is read over the intro?